Unbreakable, M. Night Shyamalan’s 2000 feature, has quite the interesting history. As Shyamalan’s directorial follow-up to The Sixth Sense, audiences and critics had a lukewarm reception to Unbreakable. The Sixth Sense made a huge impact at the time, especially with its big twist at the end (which, in retrospect, seems kind of obvious). Audiences expected another psychological thriller in the same vein as The Sixth Sense, but Unbreakable was a subtle super hero film masquerading as a drama (the super hero aspect was underplayed in marketing, as Disney – who distributed the film under their Touchstone banner – felt the genre wasn’t “lucrative” enough. My, how times change). Over the years, however, Unbreakable not only gained a cult following, but is now often regarded as M. Night Shyamalan’s best film. Shyamalan himself even regards it as his personal favorite film he’s directed. 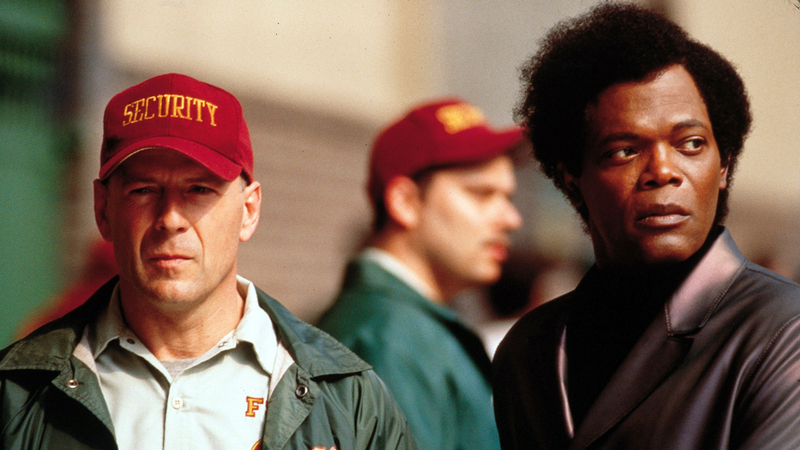 All this praise is with good reason: Unbreakable is M. Night Shyamalan’s best movie. Now, given the director’s shaky resume following Unbreakable (to put it lightly), that may sound like a backhanded compliment. 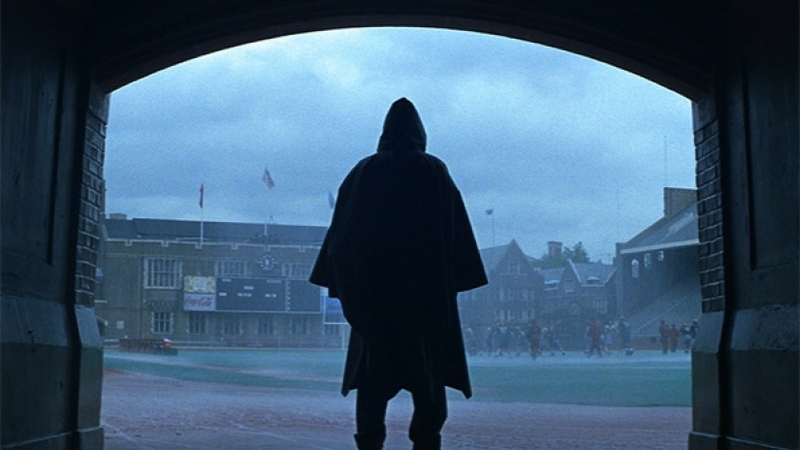 But I say this is Shyamalan’s best film with complete sincerity, as Unbreakable was not only a great movie in 2000, but is a rare example of a film that has become deeper and more relevant with age. It would still be two years until Sam Raimi’s Spider-Man turned the super hero film into the go-to genre for blockbusters. And yet, Unbreakable felt like a deconstruction and rethinking of that very genre before it really kicked off. 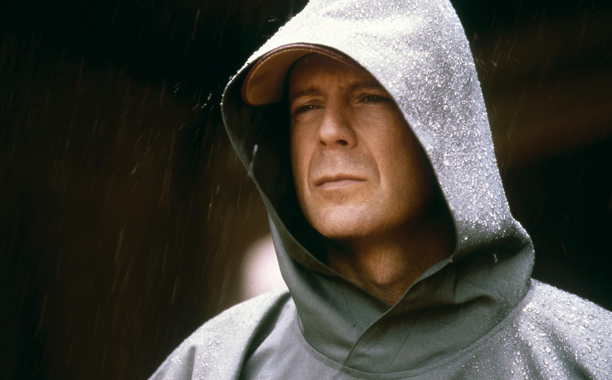 Unbreakable tells the story of David Dunn (Bruce Willis), a security guard and everyman seeking a purpose in life as his marriage begins to fall apart. On his way home from a job interview, his train (the “Eastrail 177”) crashes. Miraculously, David is not only the sole survivor of the train crash, but walks away from the disaster completely unscathed. At the memorial service for those that perished in the accident, David receives a message to meet with the owner of Limited Edition, a comic book art gallery, who is fascinated with David’s situation. The owner of Limited Edition is one Elijah Price (Samuel L. Jackson), a super genius born with Type I Osteogenesis Imperfecta, a condition which makes the bones extremely fragile and easy to break, earning Price the monicker of “Mr. Glass” during his childhood. Price – a lifelong fan of comic books – has long held a theory that there may be some truth to the superhuman nature of comic book heroes, and that if someone with his extreme frailty exists, then there may exist his extreme oppose, a person who is more or less unbreakable. That is to say, a super hero. David Dunn, naturally, believes Price to be a kook. But Dunn’s young son, Joseph (Spencer Treat Clark), believes there’s something to Price’s theory. The rest of the film is more or less an origin story, with Dunn coming to the realization that there may have been something more to his miraculous survival than sheer luck. And as David and his son try exploring and coming to terms with his superhuman abilities, they are under constant watch by Price, who begins an uneasy friendship with Dunn. What really stands out about Unbreakable is that it’s a very grounded super hero film. Dunn may possess traits of invulnerability and superhuman strength, but it’s never presented as particularly farfetched. For example, Dunn begins learning of the depths of his strength when his son adds about two-hundred extra pounds to his daily weightlifting, far more weight than Dunn previously thought he could lift. It may not be ‘realistic‘ per se, but it’s an exaggeration of reality. David Dunn is not about to leap tall buildings or shoot lasers out of his eyes. There’s nothing wrong with heroes with more fantastic powers, of course. But in this day and age when it seems every blockbuster features numerous characters who can destroy cities with their every grudge match, it’s really interesting to look back on a movie that – in 2000 – tried to subvert that. This was five years before Batman Begins grounded Batman, a super hero who already doesn’t have super powers. But Unbreakable tells the story of a man who possesses superhuman abilities, yet convincingly presents it as real. David Dunn never ends up donning a super suit, though he does end up with raincoat that reflects the capes and cowls of many heroes. Even when David Dunn confronts his heroic nature to stop an evildoer, it doesn’t culminate in an epic battle with a super villain, but saving a family from a (depressingly real) home invasion. Elijah Price, knowing a thing or two about comic book heroes, often dissects the genre, its heroes and its villains when trying to help David find his place in this mythos. In retrospect, Unbreakable almost seems to be a commentary on the super hero genre, while simultaneously embracing and rethinking it. I enjoy the MCU as much as anyone, but Unbreakable seemed to predict the over saturation of the genre it loves and expresses a means to keep it fresh and unique years before the genre needed help in those departments. It’s not just genre subversion that makes Unbreakable a captivating entertainment. It also works on a more human level, with David Dunn and Elijah Price being two brilliantly realized characters. Just as much of the film is focused on Dunn trying to work things out with his wife Audrey (Robin Wright Penn) for the sake of his son as there is to Dunn’s discoveries of his superhuman nature. And by description (a man who believes comic book superheroes are real), Elijah Price may sound crazy, but the film does a great job at understanding his mindset, and his yearning to discover his opposite. Unbreakable works as both a character-driven drama and as an alternative super hero flick. It takes its time to tell an origin story that may only serve as the first act in any other super hero movie, and it’s all the better for it. If Unbreakable features one grave flaw, however, it’s the ending. No, I’m not talking about the film’s twist (which, unlike many of Shyamalan’s plot twists, feels neither forced nor a crutch for the entire film to hold onto). That twist actually helps shake up the film from a character standpoint. But even Unbreakable’s most diehard fans will tell you that what comes immediately after said twist is disappointing. And that’s because, after the twist, the movie just abruptly ends…with on-screen text. It’s weird, because you can’t imagine there would have been all that much movie left anyway, but it would have helped the movie come to a far more satisfying close if we actually got to see these ending events unfold, instead of simply being told “here’s what happened.” It’s a popcorn fart of an ending to an otherwise captivating movie. Ending aside, Unbreakable remains a standout feature in the super hero genre. And uniquely, it has only become a greater standout over the course of time, and the countless super hero films that have been released since. Unbreakable is a low-key character drama and innovative dissection of the super hero genre that has, like a fine wine, only gotten better with age. I have to admit Unbreakable is one of those films I never really thought highly of. Granted, I do think it’s above-average overall and the twist is actually fairly solid, yet I think the pacing was too slow for the kind of film it was trying to be, and it featured acting I didn’t particularly care for. Still, it was a decent effort, and I would be more likely to recommend it than not. Fair points, though I hope you don’t find your reliable source any less reliable because of them. If you gave The Last Airbender or Lady in the Water an 8, maybe, but we don’t have to worry about that. I’ll take people’s word on Lady in the Water for now. As for Last Airbender, that’s one of the worst movies I have ever seen. I may torture myself and watch it again for a review though. I normally don’t care for M. Night Shyamalan movies. It’s been forever since I’ve seen The Sixth Sense, so maybe I shouldn’t say too much on it, but I don’t remember it living up to the hype. And I liked elements of Signs, but the ‘twist’ was so goofy it dumbed down the rest of the movie. I watched Unbreakable for the first time for this review and greatly enjoyed it. I also watched Split (which I also enjoyed, but not as much), and I’ll probably review that next. I’m curious to see Glass, despite the mixed reception. I can understand your points on Unbreakable. But for me, it worked. An 8 may seem high, but I found it to be one of the more original super hero films I’ve seen.